The cotton thread pack used to stitch the original model of GP-255 Hungarian Folk Art No. 2. I promise, the design and these colors will just make you happy! The Hungarian Folk Art No. 1 Thread Pack includes 9 colors of Sulky 12 wt. Cotton Petites Thread. Sulky Cotton Petites are a single-stranded 12 wt. cotton thread (a spool contains 46 meters/50 yards). 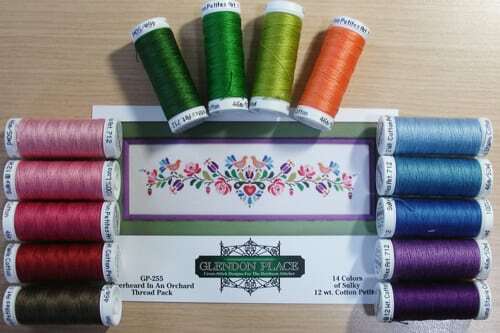 The thread pack contains the following colors.